Since 1972 existed the district Bayonne-Anglet-Biarritz which realized in particular infrastructures of transport. On December 31st, 1999 the district was transformed into community of urban area (The Basque Coast Adour) and was equipped with new skills. It exercises 4 compulsory skills: economic development, arrangement and town planning, social balance of the housing environment, the urban affairs and optional skills. In the confluence of Adour and Nive, in 6 km of the sea, on a swampy zone dried up between close Landes and Pyrenean foothills, Bayonne is the main city of the Basque country on the Economic plan, it played a very important role in the development of the region. Former(ancient) castrum in the time of Romains, named Lapurdum, a victim of successive invasions, it will take the name of "Baiona" only in 10th century, meaning " good river ". The city will know its first Golden age thanks to the Dukes of Bayonne, with the development of the business, Cathedral, Convent and Castle will then be built. Before falling again in the French lap in 1451, Bayonne was for a long time under English influence, the English people had then made one of their fortified towns at the same moment serviceman (Bayonne testifies of it always today by being surrounded with 3 ramparts) and commercial, during the Hundred Years' War Bayonne moreover remained faithful in English people, the same Castile which claimed then the city and Labourd never reached its purposes. From the 16th century and the creation of the new mouth of Adour, Bayonne prospered strongly and embellished a lot. Today the city stend on 3 districts, and trains a beautiful set, with a conservation area, a very active and creative life. Stayed in the distance of the tourist effervescence of Biarritz the city knew how to develop an Economic dynamism by welcoming companies such Dassault Aviation, the port is always very active too. 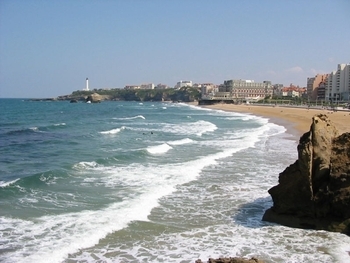 Biarritz is doubtless one of the most renowned French sea resorts. After development thanks to the activity of it sins in the Middle Ages, Biarritz will stay nevertheless until the much less dynamic 18th and recognized than its sisters of Saint Jean de Luz and Bayonne who have then the preferences of the monarchy. From the 18th century, any exchange, the holiday resort of the seaside becomes very fashionable and rich, celebrities, artists and the powerful invade Biarritz, Napoleon in 1808 then Victor Hugo, Stendhal then Napoleon III made build in 1854 the villa Eugenie. Since then, except during the war 39/45, Biarritz will not until today stop attracting the vacationers, the French people, the Spaniards, the Germans or the English people, rich and famous who will build tens of luxurious villas there to organize the most magnificent evenings there. These magnificent and quite original villas make of the architecture of Biarritz a harmonious mixture today, sometimesold-fashioned mixture, but not without charm, of very different styles today. 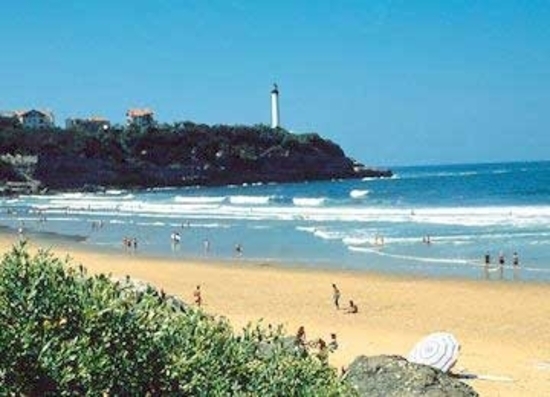 Biarritz thus remains very fashionable, the surfers, golfers and the other followers of the game or the Thalassotherapy are there to give evidence of the charm always exercised by the sea resort in 21th century! To visit Biarritz, nothing better that to leave the Lighthouse of the point Holy Martin to discover it the geography of the city: the coast makes of beaches for the North which get beyond Anglet to Landes; and in the South both main beaches of the bay of Biarritz, the beach Miramar and the hotel of the Palace, the big beach and her Casino. Far off always southward, the small port of sins embedded in the rock, and a little farther still the famous Rock of the Virgin, the emblem of the city, connected with the coast by a metallic footbridge conceived by Eiffel. Finally, at the end of the rocky spurs of the bay, another symbol of the architectural wealth of the city and of its) luxurious past: the Villa Belza, built in the end of the 19th by the architect Alphonse Bertrand. Visit the central beaches by roaming along the walk following the seaside up to the Rock of the virgin, by way of the port of sin, the rich and tortuous avenues of the city center and their beautiful and luxurious shops of big marks, make a tour to the Casino Bellevue, discover the Museum of the Sea on the Esplanade of the Rock of the Virgin; also visit the Holy district Martin and its church dating 1342 which established then the center of the first medieval village, the Castle Gramont which welcomed Napoleon and Eugénie, the Castle Boulard which faces her, then in the North of the city, the Imperial Chapel built in 1864 at the request of Empress Eugénie. January 1st, 2011 "BAB" passes from 3 to 5 municipalities and changes name. The cities of Boucaut and Bidart were added.